And there’s no Emmanuel Macron. And no Theresa May either. They all dropped out. Whoa. France, the United Kingdom and the United States used to be the essential ‘committee to save the world.’ A bombing action against Benghazi, a big global shove towards a climate change deal, or trying to nail down global uneasiness on the Iran Deal were often precipitated by op-eds signed by Obama, Cameron, and either Sarkozy on Libya or Hollande on Iran. But they are out. Trump is not at the party. And the best I can tell, Davos doesn’t feel empty without him. 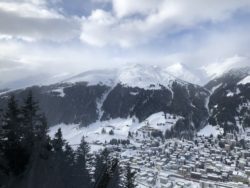 But what is worrisome is what the Davos crowd is filling that void with. For starters, on Tuesday (tomorrow) newly elected Brazilian right wing populist President Jair Bolsonaro will be the first head of government to speak. Bolsonaro has mimicked Trump’s executive order two-step by almost immediately weakening gun ownership laws, undermining land set asides for Brazil’s indigenous populations and descendants of slaves, and dropping LGBT discrimination from the official roster of concerns of Brazil’s new Ministry of Human Rights. There’s a party starter. And that’s not all, folks. 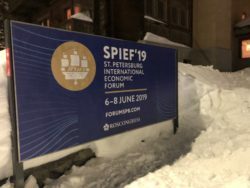 The moment I got off the train at Davos Platz was a sign pumping attendance at the June 2016 St. Petersburg International Economic Forum. This is the St. Petersburg in Russia, and the Forum is a pet project of Vladimir Putin. Just keep that whole France, UK, USA oped thing in the back of your mind. 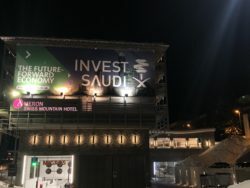 And THEN, giant sign stretched over the massive side of the centrally-located Ameron Hotel is none other than an “Invest Saudi Arabia” advertisement. Maybe the Crown Prince bought the ad before the whole Jamal Khashoggi murder thing, and thus they were stuck with this poor taste legacy ad buy. In different times, if the US wasn’t in the game, there was no game. Eminem’s lyrics were dead on then, if we were indeed talking about a country and not him. There was only one big fish in the sea and it would have felt so “empty without me,” meaning the big me, or the big we. For nostalgia’s sake, I went back to listen to Bill Clinton’s Davos speech in 2000, almost two decades ago. To get a feel for why so many globalists here are done with American attitudes today, at least the temporarily dominant personalities in the White House squelching the more sane personalities buried somewhere in Trump Land, just spend a moment reading how Bill Clinton framed the risks and rewards looking forward to where we are today – but from his perch back then. As we know, in many ways the global economy was almost as integrated as it is today a hundred years. But after World War I, leaders in the U.S. and Europe made what we all now recognize were false and short sighted choices. Instead of partnership they chose protectionism and isolationism. And for decades, globalization went in reverse with utterly disastrous consequences. After the Second World War, the leaders were given a second chance. This time it was clear that what was at stake was not just prosperity — but the defense of freedom. They chose the path of political and economic partnership. And they set the stage for 50 years of growth around the world. No one can seriously argue that the world would be a better place today if they had reverted to the old isolationism. Well, that didn’t hold. America First has sent a signal that many in the USA, not all but many, want a redo of that choice in the past, want that ‘old isolationism,’ want to shake down partners, engage in mercantilist protectionist trade practices, and pull the legs out of international institutions. It will be so great without who? Steve, all this international hullabaloo doesn’t matter to the average Deplorable. They won’t rouse from their stupor until they can’t afford tickets to the next Avengers movie or the thing they want to buy on the Wal-Mart shelf. While I would love for our Allies to understand that our domestic violence is likely to be due for a correction in the coming years, I totally understand if they decide to start seeing other people. If I were them, I’d date other people, too. Spunkmeyer — I mostly agree. Trust is broken. Our previous relationships are broken, and they are certainly ‘looking’ for others to engage. There may be no one for them given the limited cast of options. That said, and perhaps more optimistically, all of those in the ‘previous partnership’ are subject of the same types of multiple personality disorders. So maybe, just maybe, all of these countries — including the US — finds a way to bury the dysfunctional personalities, restore the healthy ones, and just all understand it was just a weird phase. I doubt this will happen — but it’s possible. Thx! “The world advances progressively backward” (Edmund Burke, 1770). Is Europe present (Tusk, Juncker, Tajani), and a representative of ‘Volt’, a new pan-European political party? How can we turn the tide of a world turning more Hobbesian into (geo) politics, economics and finance, and a world of ethnic distancing and religious separatism, imposed and directed by by strong central authorities towards modern humanism and practices of comity? Is moral capitalism on the program? And how about Europe (federalism, completing EMU, common defense, migration, tax harmonization)?